Down Roller Coaster Rd to Albertsons for a Starbucks. See the end of this for the sequel. This is not amusing. It has nothing really to do with the RV or the bike, but I have to vent somewhere. There is a new update to Mac OS X. Apple asked if I wanted to install on my laptop. I said yes. Then I got a warning that there wasn't enough disk space on my laptop to do that. And then it went ahead and tried to install the upgrade anyway. The result of that was a laptop that won't boot. I did get it to boot off of a CD-ROM version of the system software. And now, using software on that repair disk, I am restoring my laptop system as it was when it was backed up yesterday, creating a new system disk on an external drive. That will take about four hours. The plan is then to boot the laptop off the external drive, and go about repairing whatever the damag is to the internal disk. More fun than pack rats, I'll tell ya. Good thing almost all my crucial information is stored on the cloud, and that I can get at it by way of the iPad. It's a good night for a Chinese buffet. All seems to be well, although I'm a bit nervous because I don't exactly know what I did to fix it. I managed to get the Finder (Apple's confusingly-named user interface) user interface to appear. At that point I was able to delete some files, thus alleviating the "out of disk space" problem. I did a full backup at that point, and then installed the OS X update that started this. As far as I can tell, the only loss is some video files on external drive. No biggie. Luckily. 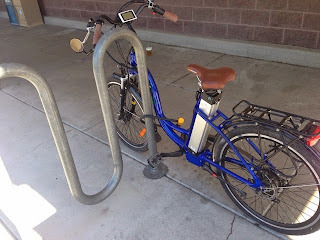 We now resume our previously scheduled ramblings about e-bikes and RV's. harley is an electric-assisted bike distributed by e-joe; they have three models; this is a refurbished 2013 "Anggun." It arrived yesterday noon and I spent most of the day puzzling out how to put it together. Essentially zero directions: here's your box, sign here, have a good day. If you're interested in learning more about bikes like this, check here. 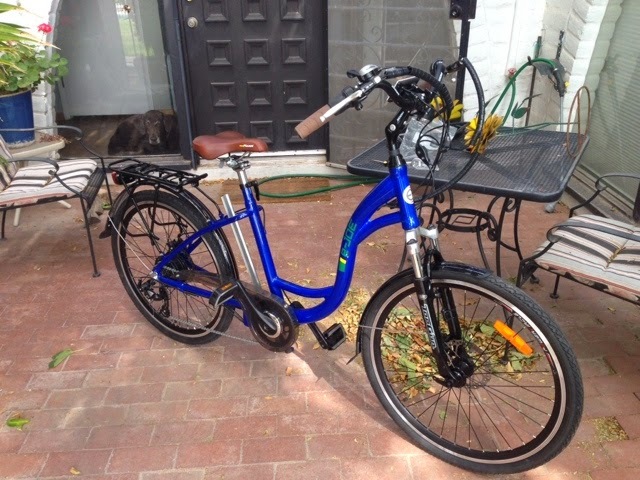 What drew me to this one was the step-through frame (my back and hip won't make it over the bar in a conventional frame,) the battery capacity (which should give me a cruising radius of about 35-40 miles,) and the relatively low price. The company mostly does business through local bike shops, but right now there's nowhere in Tucson that carries this. So I'm kinda on my own. I went out and tooled around my complex and the parking lot of the church across the street for a while. Some modest hills, which the thing ate for breakfast. I'm still wobbly and all newbie about bike riding, but it's coming back fast. And man, is it fun! It has a max speed of 20mph; I got to 12 in the parking lot without sneezing. The back and hip problems have taken me out of a lot of activities I loved. But this may put me back outdoors, and get me some exercise I badly need. The power assist is only there if I want it; I can pedal on my own until I get tired, and then let harley take the edge off. Oh, and yes, I biffed once -- I was coming to a stop on an uphill preparing to cross the road, and just lost it. 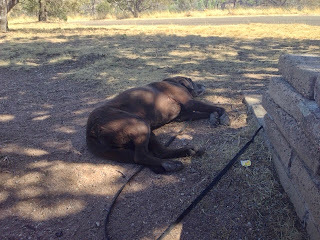 Nothing worse than wounded pride and some mild road rash; harley wasn't fazed. Oh, and yes, I'm wearing a helmet. View from drivers seat. 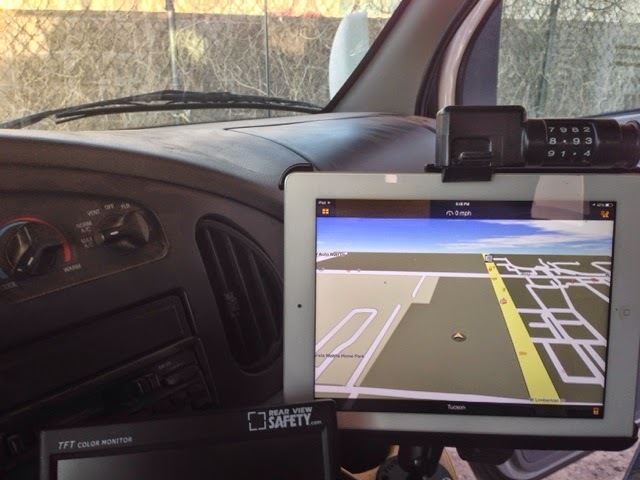 My iPad 2 running Garmin's Navigon software. Securely held in a locking frame and support from Ram. The iPhone display was simply too small to be seen in the RV cab. Besides, this is so cool! Removed from power distribution center. This just might have something to do with the fuse keeps blowing. If you're not from this part of the country, it's a pack rat nest. I'm gonna enjoy this. My fears about navigating the RV is traffic and on streets have pretty much resolved. Merging R in traffic is still a little nervous-making, but I'm learning to change lanes WAY before I have to, L and R. But the feeling of setting out in this is very similar to the feeling of standing at a trailhead, leaving the car and house behind, and heading out. Emma is NOT enjoying this. She trembles and pants and drools and whines softly most of the time. This morning was especially hard for her: it was bumpy and noisy road right from the get-go. One we were in camp, especially someplace with nice shade, she just flopped down and did her Lab thing, as the picture in the previous post shows. I'm thinking I may have to get her some pretty strong meds for this problem, but I'll give her as much time as I can. For the most part the rig performed really well. 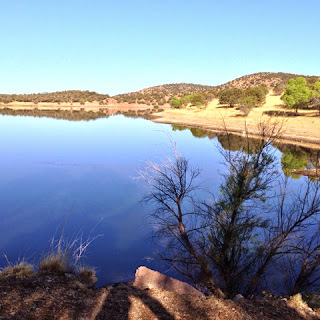 I got an overall mpg of 10.1 -- and that's with some rough up and down driving going in and out of Parker Canyon Lake. I think if I ever decided to get on an Interstate in, say, Nebraska, and let the cruise control keep a constant speed, I'd get more like 12. Of course, I'm not really enthusiastic about Nebraska... Depending on the trip, I'll budget 8 or 10 mpg when I plan. It's noisy. I think a lot of what I'm hearing is transmission noise from the "doghouse" right at my knees. And no matter how carefully I've packed so far, there's always an assortment of rattles from the "living" area. There's a little monitor panel which displays the status of the water tanks and the battery. The display is in the form of a line of LED's -- think about the thing on your phone which tells you how strong the signal is. It was pretty erratic, and even though I emptied both holding tanks on my way back, it's still telling me the black water tank is full. And this morning for a while it told me that the battery was almost dead, when it wasn't at all. THAT corrected itself. Maybe it was cold? One of the 12V fuses keeps blowing. The circuit powers the TV and a nearby ceiling light. I replaced it three times, it worked for a while, then buh-bye! It's either the wire from the power center to the outlet (pack rats?) or the outlet. 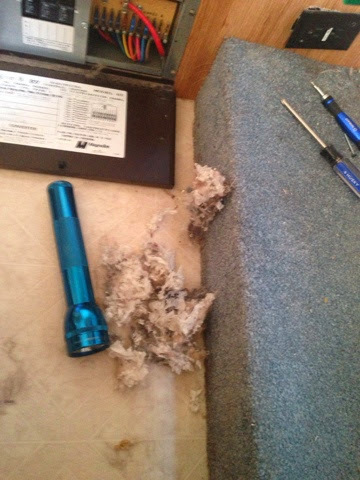 I think I'll take the outlet apart and disconnect it and see if the light works and keeps working. It's not crucial, but it needs to be fixed at some point. The latch that holds the cabinet doors over the sink won't stay closed. The doors open and bang around; so far nothing from inside the cabinet has joined the dance. The shower curtain won't latch in the closed (in use) position, and water splashes out. Next trip? Maybe this coming weekend up to Phoenix for the annual Bartlett Lake Bash. This place was as pleasant as David's Oasis was barren. 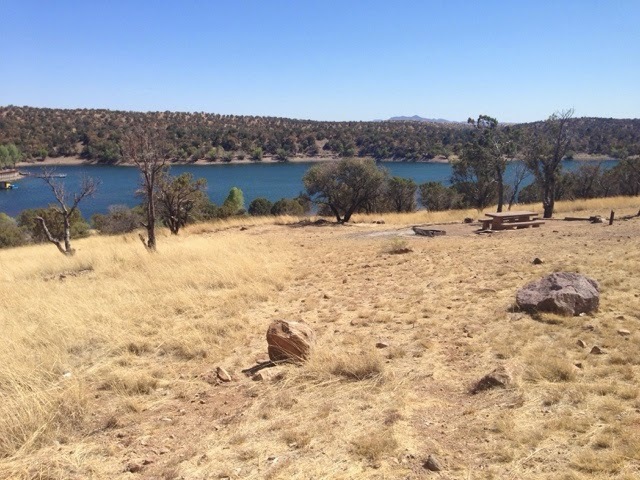 It's a US Forest Service campsite, which means pit toilets and no "amenities." Dry camping. But the sites are roomy and level, and the surroundings couldn't be nicer. The fishing here is apparently pretty good, and canoes can be rented at a small "marina" if you want to go poke around the lake. The drive in on AZ 83 has its challenging moments: in places, it's a 1 1/2 lane blacktop. Lots of ups and downs and sharp turns. 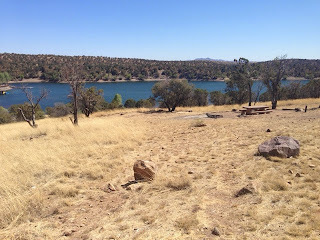 It's not exactly on the way from anywhere to anywhere else, but it's a great quiet pleasant spot down near the Mexican border. It's the kind of place I imagined I'd find when I thought about getting an RV, and I'm grateful to Steve for pointing me toward it. 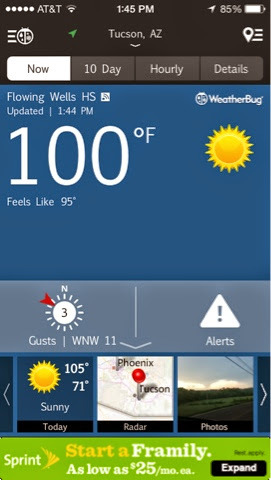 It's only a couple of hours from Tucson, and I can imagine going back for a weekend of relative cool of 5400 feet elevation. It's bear country, and bear-proof trash cans are provided. It has a "clubhouse," the building in the background of this pic, and an area called "The Corral," which is clothing-optional, and has a hot tub and an above-ground pool. All RV sites have fill hookups, but the promised wi-fi was pretty spotty. DO is listed in directories of gay campgrounds, and has until recently marketed itself to a gay clientele. That's changing, and the plan now seems to be to appeal to a wider audience. This will be an uphill slog. The two staff I met could not have been more pleasant and helpful. But the place itself is, to put it bluntly, ugly as sin. The only reason to go there, it seems to me, is for a gay social experience of the clothing-optional kind. 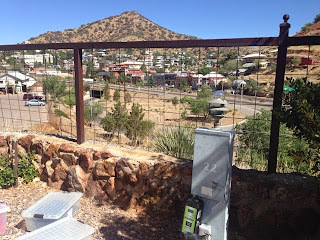 Absent that, there are other options in the Bisbee area; The Queen Mine RV Park where I stayed the previous night isn't much more attractive, but it's about a 5 minute walk into Bisbee's shops, bars, and restaurants. The DO staff said I was there "between seasons." The wind was howling, and I was the only paying customer in the place. 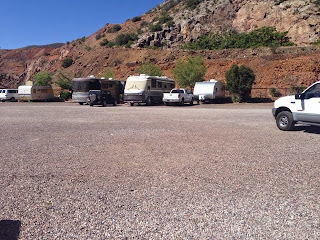 And in June, the weekend of Bisbee Pride, the place is apparently booked solid for RV's and tent campers. I don't recall the number of reservations, but it was well over a hundred. That could be a good time, since Bisbee Pride has a great reputation in the region. But I doubt they can make a go of it on a few special events. I'd like to be wrong. As things stand, I don't plan to go back, no matter how accommodating the staff. It ain't pretty but it works! 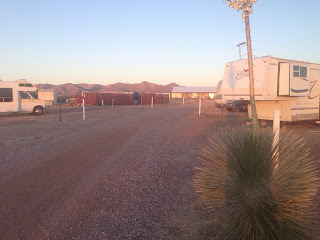 As promised, pictures from and of the Queen Mine RV park. Left Emma alone in the RV while I walked into town for dinner. The people next door report she was quiet. That works. Took a shower in the rig. While I'm connected to "city water" and the grey wastewater drains directly into my own sewage connector, why not? I was surprised that the hot water heater recovered as quickly as it. On that last point, I now see the utility of various systems to maintain a smooth descent for waste water into the sewage connection. Like this. I think this, or something like it, goes on my wish list. Sometime later I'll wander on to David's Oasis. I'm in no hurry. Glorious. My first "real" RV trek. 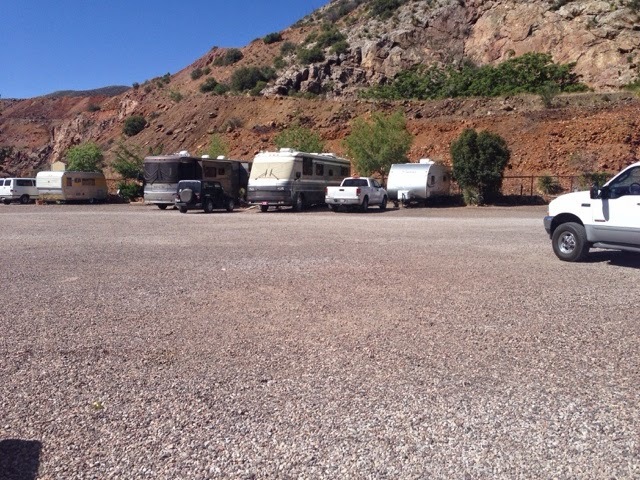 The Queen Mine RV Park has one virtue: it's real close to downtown Bisbee. Friendly hostess, too. But otherwise it's a parking lot with plumbing around the edges. I'll take a picture and post it from my phone. It offers water, 30 amps of power, sewage disposal at your site, cable TV, and wi-fi. If it had more attractions, I probably wouldn't use them. So this is perfect. A little on the ugly side of perfect, but it works. The drive down was actually kind of fun. The seats in the Beast are comfortable enough, and the cruise control makes it possible to shift positions and keep my back and hip easy. My new data port display software is a champ: I was able to monitor MPG all the way down. Turns out that somewhere around 55-65 is peak MPG. I had some gusty side winds, and it's a long slow uphill from Tucson to here. I got about 9 mpg overall. A full day of driving without city traffic would be a bit better. Maybe. I've been told that it's gonna be right around 10 on the road, almost no matter what. So far that seems about right. I stopped for lunch in a town along the way. Pulled into a Safeway parking lot and pulled food out of the fridge, walked the dog, ate. Went into ACE hardware to get some new valve caps for the tires. And on my way. A cool thing: I got just as good speed and mileage on the two-lane road down to Bisbee from I-10 as I did on the freeway. Now, I COULD have gone 75; the Beast is fully capable of that. But "poking" along at 55-60 is fine. I enjoyed it. I think I'm gonna like this. After all this time of checking things out and dealing with problems and learning to drive the Beast, I'm off for a few days to actually go somewhere. Bisbee is an old mining town south of here by a couple of hours. 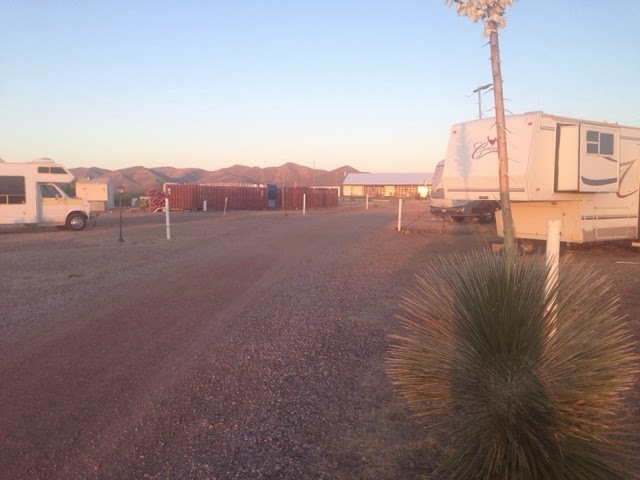 There's a well-reviewed RV park very close to the center of town: the Queen Mine RV Park. Emma and I will drive down this afternoon, and I plan on dinner at Santiago's -- one of the best, if not THE best -- Mexican restaurants I've ever been to. It's close enough to the RV park, and the people seem friendly enough, that Emma can have her first experience with being left in the rig for a while. I'll ask them to call me if she acts up. Fingers crossed. Bisbee is a quirky little artist colony and hangout for interesting people. There was some pretty good music at a bar the last time I was there. Saturday I move "camp" to a place outside of town called David's Oasis. It gets mixed reviews, but it has a pool and a BYO bar/social space, so we'll see what that's like. 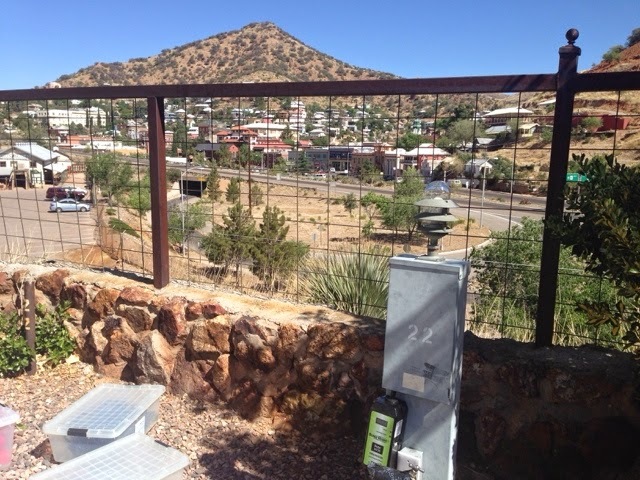 So: next entry and almost certainly some pictures, from Bisbee. It's probably worth noting that I've worked out a routine for leaving on trips which so far seems pretty good. 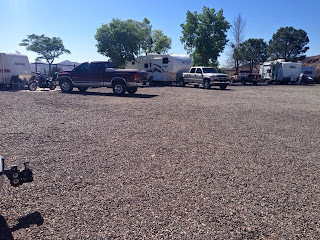 I drive the car to the RV storage yard, leave it there, and drive the rig back home. There's a level very wide shoulder on a side road here, and I left the rig there overnight, letting the fridge cool down. Later this morning I'll drive a hundred yards around the corner into the complex to my place and load in food and whatever else I think I need. And the dog! And leave. This may well fall in the category of shutting the barn door after the horse has gone. But I've talked to a lot of people who swear that it works. Apparently pack rats have permanently dilated pupils, which makes them very sensitive to light. 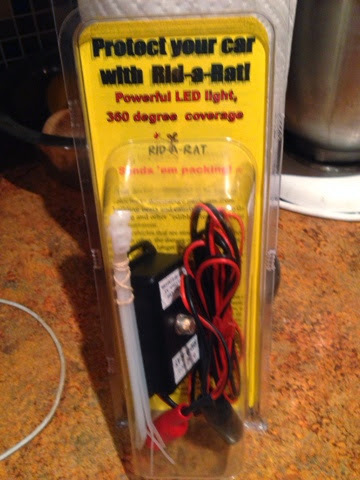 This thing flashes a very bright LED constantly in the area under the hood of the vehicle. The battery drain is described as "minimal."